One Minute Consult | How Long Can My Patient Use Intranasal Steroid Sprays? Patients who regularly use steroid sprays should undergo examination of the nasal cavity at least annually to check for damage to the septum. Children using intranasal steroid sprays should be prescribed the newer-generation formulations, use low doses, and have their growth monitored regularly. The usual prescribed dose is one or two squirts in each nostril daily. Some patients are disappointed that there is no immediate decongestant effect-optimal clinical efficacy may not be reached for 1 to 2 weeks. Patients may notice local side effects, including burning, dryness, crusting, and occasional nosebleeds. Septal perforations are rarely reported and may be related to vasoconstrictive activity of corticosteroids. Perforations are most likely to occur in the first year of use and in young women.8 To help avoid local side effects, patients should be instructed to spray away from the septum. The long-term use of intranasal corticosteroid sprays raises concerns about their possible systemic side effects. Systemic absorption occurs (TABLE 1), but few clinically relevant side effects are known.14,15. Two preparations, dexamethasone and betamethasone, have some effect on the hypothalamic-pituitary-adrenal axis. They are not currently used in the United States. Triamcinolone acetonide, budesonide, fluticasone propionate, and mometasone tend not to cause any significant side effects, presumably because they have lower systemic bioavailability (particularly fluticasone and mometasone) and are used in low dosages. The labels of intranasal sprays warn of potential effects on children's growth. Beclomethasone dipropionate spray used for 1 year affected children's growth,16 but neither fluticasone nor mometasone had this effect.17,18 Fluticasone and mometasone are approved for young children by the US Food and Drug Administration. Other side effects typical of parenteral use of corticosteroids, such as osteoporosis, diabetes, and hypertension, have not been reported with any of the current sprays. However, no studies have specifically addressed these issues, and most studies on sprays are conducted for less than 1 year. It is possible that other side effects may occur if patients use higher doses than prescribed. Other issues that need further study include the long-term use of intranasal sprays with other forms of topical corticosteroids (such as inhaled preparations for asthma), as well as with parenteral forms of corticosteroids to control inflammatory diseases such as asthma, inflammatory bowel disease, or rheumatoid arthritis. Hadley JA, Kavuru MS, Anon JB, Pien LC. Diagnosis and Management of Rhinitis and Rhinosinusitis. 3rd ed. New York: Professional Communications Inc; 2005:65. Dykewicz MS, Fineman S. Executive summary of Joint Task Force practice parameters on diagnosis and management of rhinitis. Ann Allergy Asthma Immunol 1998; 81:463-468.
van Cauwenberge P, Bachert C, Passalacqua G, et al. Consensus statement on the treatment of allergic rhinitis. European Academy of Allergology and Clinical Immunology. Allergy 2000; 55:116-134. Bousquet J, Van Cauwenberge P, Khaltaev N; Aria Workshop Group; World Health Organization. Allergic rhinitis and its impact on asthma. J Allergy Clin Immunol 2001; 108(5 suppl):S147-S334. Stempel DA, Woolf R. The cost of treating allergic rhinitis. Curr Allergy Asthma Rep 2002; 2:223-230. Juniper EF, Guyatt GH, Archer B, Ferrie PJ. Aqueous beclomethasone dipropionate in the treatment of ragweed pollen-induced rhinitis: further exploration of “asneeded” use. J Allergy Clin Immunol 1993; 92:66-72. Dykewicz MS, Kaiser HB, Nathan R, et al. Fluticasone propionate aqueous nasal spray improves nasal symptoms of seasonal allergic rhinitis when used as needed (prn). Ann Allergy Asthma Immunol 2003; 91:44-48. Cervin A, Andersson M. Intranasal steroids and septum perforation-an overlooked complication? A description of the course of events and a discussion of the causes. Rhinology 1998; 36:128-132. Holm AF, Fokkens WJ, Godthelp T, Mulder PG, Vroom TM, Rijntjes E. A 1-year placebo-controlled study of intranasal fluticasone propionate aqueous nasal spray in patients with perennial allergic rhinitis: a safety and biopsy study. Clin Otolaryngol Allied Sci 1998; 23:69-73. Minshall E, Ghaffar O, Cameron L, et al. Assessment by nasal biopsy of long-term use of mometasone furoate aqueous nasal spray (Nasonex) in the treatment of perennial rhinitis. Otolaryngol Head Neck Surg 1998; 118:648-654. Pipkorn U, Pukander J, Suonpaa J, Makinen J, Lindqvist N. Long-term safety of budesonide nasal aerosol: a 5.5-year follow-up study. Clin Allergy 1988; 18:253-259. Bircher AJ, Pelloni F, Langauer Messmer S, Muller D. Delayed hypersensitivity reactions to corticosteroids applied to mucous membranes. Br J Dermatol 1996; 135:310-313. Gonzalo Garijo MA, Bobadilla Gonzalez P. Cutaneousmucosal allergic contact reaction due to topical corticosteroids. Allergy 1995; 50:833-836. Passalacqua G, Albano M, Canonica GW, et al. 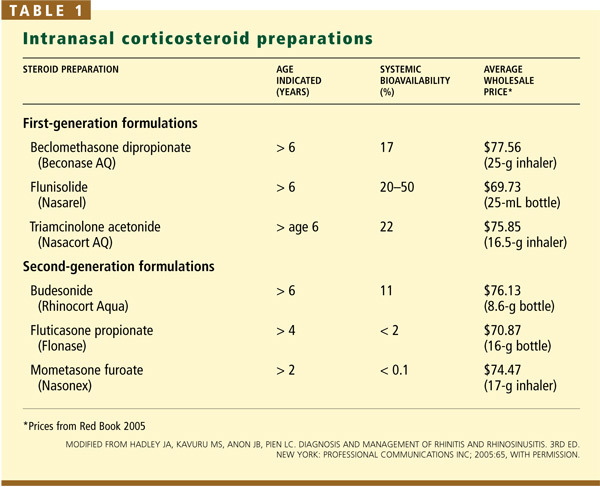 Inhaled and nasal corticosteroids: safety aspects. Allergy 2000; 55:16-33. Cave A, Arlett P, Lee E. Inhaled and nasal corticosteroids: factors affecting the risks of systemic adverse effects. Pharmcol Ther 1999; 83:153-179. Skoner D, Rachelefsky G, Meltzer EO, et al. Detection of growth suppression in children during treatment with intranasal beclomethasone dipropionate. Pediatrics 2000; 105:E23. Allen DB, Meltzer EO, Lemanske RF Jr, et al. No growth suppression in children treated with the maximum recommended dose of fluticasone propionate aqueous nasal spray for one year. Allergy Asthma Proc 2002; 23:407-413. Schenkel EJ, Skoner DP, Bronsky EA, et al. Absence of growth retardation in children with perennial allergic rhinitis after one year of treatment with mometasone furoate aqueous nasal spray. Pediatrics 2000; 105:E22. Garbe E, LeLorier J, Boivin JF, Suissa S. Inhaled and nasal glucocorticoids and the risks of ocular hypertension or open-angle glaucoma. JAMA 1997; 277:722-727. Derby L, Maier WC. Risk of cataract among users of intranasal corticosteroids. J Allergy Clin Immunol 2000; 105:912-916.